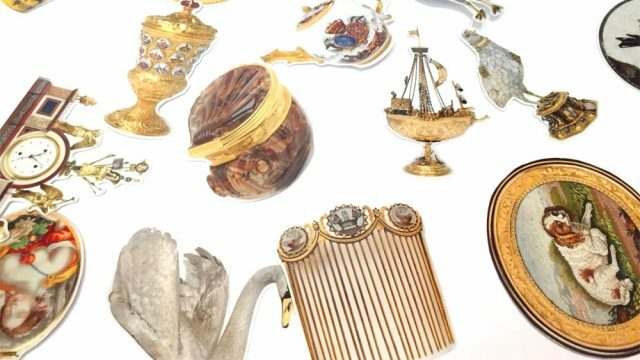 The Elephant & Castle Mini Maker Faire is coming back to London this autumn, and the Digital Programmes team at the V&A recently launched an open call for the commission of an interactive installation to be exhibited at the Maker Faire. After receiving a great number of amazing proposals – I wish we could show everything! – and long discussions between myself, Alex Flowers (Digital Programmes), Ben Stopher (London College of Communication and Elephant & Castle Mini Maker Faire), Louise Shannon (Curator of Digital, V&A) and Filip Visnjic (Creative Applications) we can finally share the winning project and three shortlisted proposals! So we are very pleased to announce that Paper Playscapes, a project by Artemis Papageorgiou and Gabriella Mastrangelo, will be commissioned from this open call! Paper Playscapes is an open-ended installation representing a landscape in movement, one made and played collaboratively by the designers and the visitors. Its vocabulary is based on the truncated tetrahedron. By embedding paper electronics and a simple interaction the designers create a cell that, by the end of the installation, propagates in space to shape, a spontaneous, responsive structure. The installation will consist of six ‘pillars’, fixed modules also serving as play elements of a game designed for the installation. 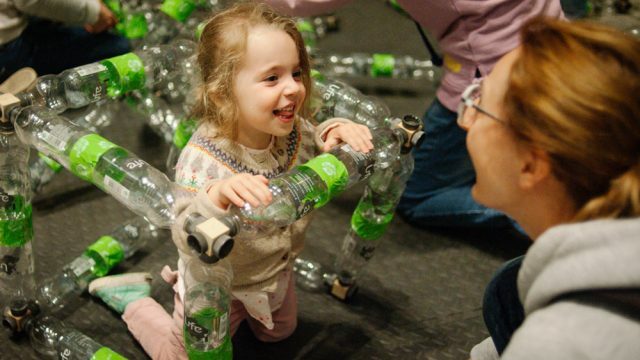 Visitors will be invited to join in assembling and creating the structure and then play! The final outcome is a landscape in the making, a participatory space for dwelling together for a few moments, in order to learn, make and play. Paper Playscapes will create an open space, where people come together to explore, create, share and play. We are looking forward to presenting Artemis and Gabriella’s project at this year’s Maker Faire and at the V&A! Artemis and Gabriella met while working together at Cinimod Studio in 2010. Since then they moved back to their home countries Greece and Italy and continued their practices as designers, artists, makers. Artemis has co-founded Athens Plaython, a festival introducing play in the streets of Athens and the design lab Entropika, focusing on multimedia art projects and interaction design, while Gabriella has co-founded Make People Do Lab producing and teaching workshops on design and craft and Bling Bling paper architectures exploring geometry and soft materials. 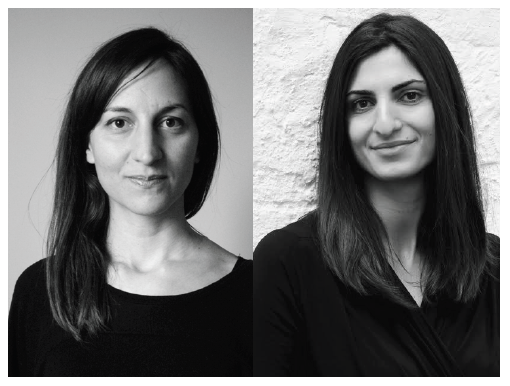 During the last few years, their overlapping passion for architecture, making, participatory design, interactivity and education has emerged in their practice. The design is inspired by the 1960s and 1970s movements Op Art and Arte Concreta, and in particular Bruno Munari’s game Aconà BiconBì, which the designers use as starting point for the architectural form. Instead of Munari’s triangle they use the truncated tetrahedron. Participants are invited to step in and co-create a landscape-in-movement, as Gilles Clément would phrase it. The final outcome of the piece depends on people’s engagement. The module is made out of corrugated cardboard, a sustainable cost-effective material that is easily assembled by a non-skilled audience. 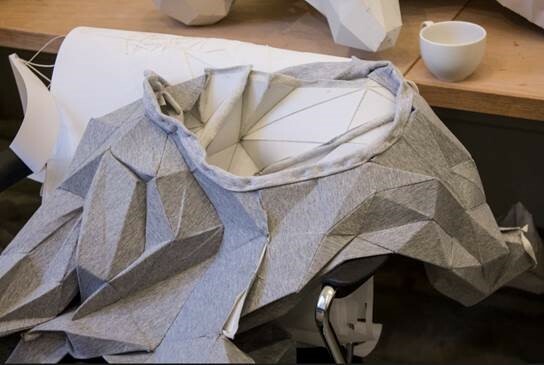 Even though modules originate from pre-cut, printed surfaces and therefore identical before assemblage, they are differentiated through folding and circuit-drawing. Artemis and Gabriella have kept Munari’s circle as the core of their module by turning it into a switch. Each cardboard module is designed to react to proximity and contact by emitting light through a series of LEDs placed on its surface. A simple circuit is printed on one facet and a circle on the other. Each sheet is pre-cut and the circuit is printed on the surface. The circuit includes the micro-controller ATtiny, three LEDs, and a capacitance sensor as the conductive circular surface. The final shape of the installation is unpredictable, yet there is a designed framework to work with. The installation is situated on a hexagonal space of a two-metre diameter, marked by six fixed seating modules on the corners and floor marks indicating the area of ‘action’. 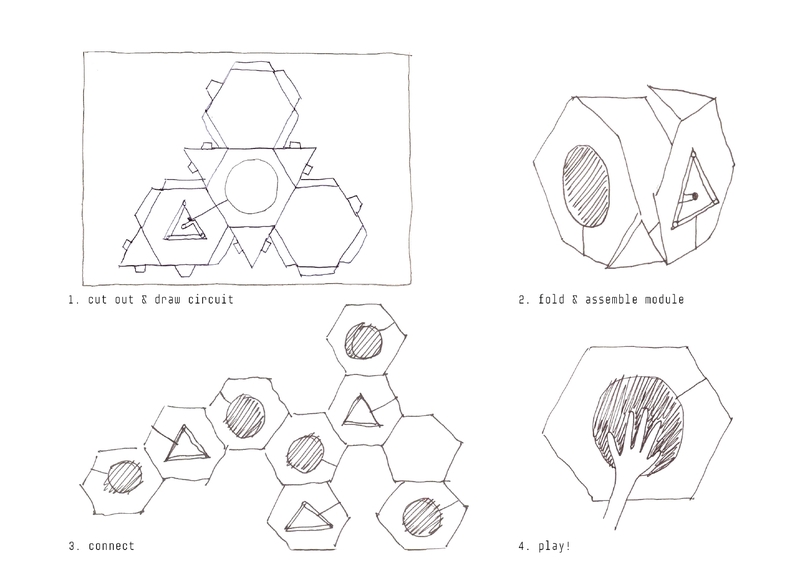 These six modules are the pillars of the installation as they constitute both the starting point for construction and the play elements of a game. People can construct all around them creating bridges and connections as long as the outcome is free-standing and solid. And then we play! The starting point for the game is the traditional Music Chairs, where people try to sit on a number of chairs at the end of a music round, which is always smaller than the number of the players. In Paper Playscapes, each seat has embedded electronics controlling a set of LED lights on the module surface. 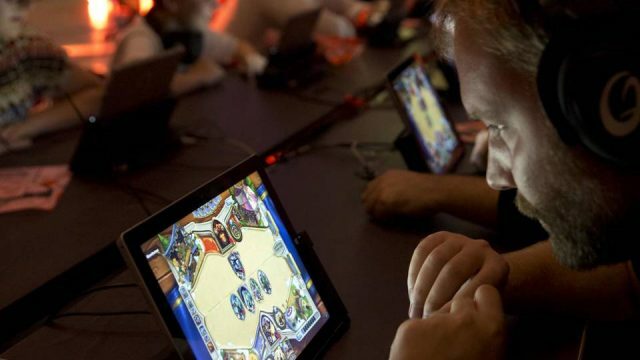 A black circle on the surface triggers a distinct game mode, creating a new game sequence in each session. Two teams of three people compete for the last seat that remains lit on the hexagon plan. The winning team is the one whose member remains the last seated. Six different rounds are triggered randomly by the players through the seat switch. At each round music starts and when it stops the lighting turns off on one seat. Music plays through six custom made speakers with a tetrahedron housing, controlled by an MP3 shield attached to the Arduino Mega. Please come along to make and play Paper Playscapes at the Elephant and Castle Mini Maker Faire on 15th November 2014 at London College of Communication! 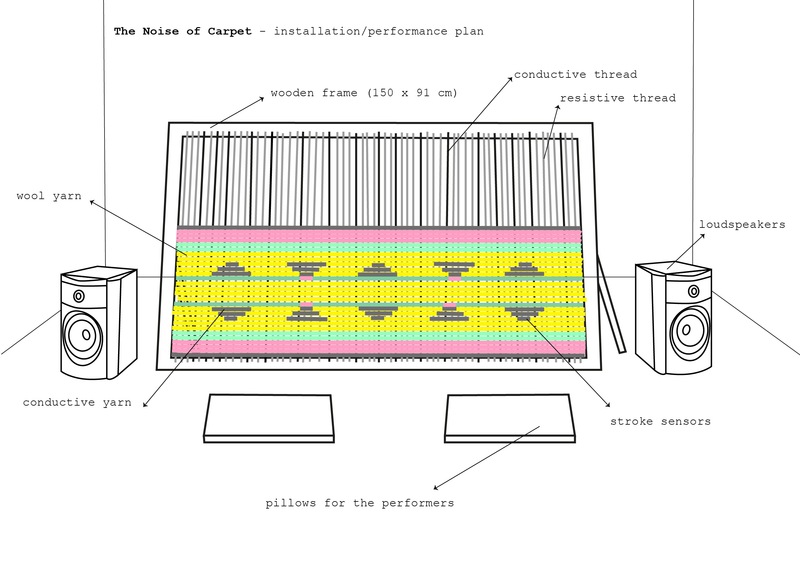 The Noise of Carpet consists of an interactive installation and a live sound performance of a handmade carpet interface in weaving process. The performance presents two female weavers working on the production of a carpet using hand knotting traditional techniques and simultaneously produce sound while touching the yarns converting the act of weaving into a unique sound synthesis. Visitors can interact with the carpet and create their own soundscape through haptic exploration. The project aims to evolve a traditional craft in order to create a contemporary sound device. The weaving process extends from an act of making to a kinesiologic research, as a human gesture stresses the physiological understanding to a mechanical one (production of the carpet), and it is translated to an experiential mechanism (sound). Furthermore, the project explores the future of craftsmanship and the place of handicrafts in an ever evolving technological world. It questions how folk culture can be incorporated in everyday life by creating objects that carry a historical and archival tradition as a means of artistic, scientific and sonic experimentation. Conductive and resistive yarn runs through the length of the carpet and wefts threads pass under and over the warps from one side to the other creating a semiconductive grid. The warps on either side of the carpet are connected to cables which again are connected to an Arduino controller and audio speakers. This construction allows touch and position to be detected and translated into sound. Afroditi Psarra (Athens, 1982) is a multidisciplinary artist and a PhD candidate at Complutense University of Madrid, in the field of Image, Technology and Design. Her work explores the boundaries between traditional handicrafts, pop culture and science fiction. Her artworks include a wide variety of media, from electronic embroideries and wearables to interactive installations and sound performances. She has presented her work in numerous media art festivals and she has worked as an intern at Disney Research in Zurich. Maria Varela (Athens, 1984) works as a media artist and designs workshops seeking to develop strategies of collective production. In 2010 she completed her MA studies in “Interactive Media” at Goldsmiths College, London. 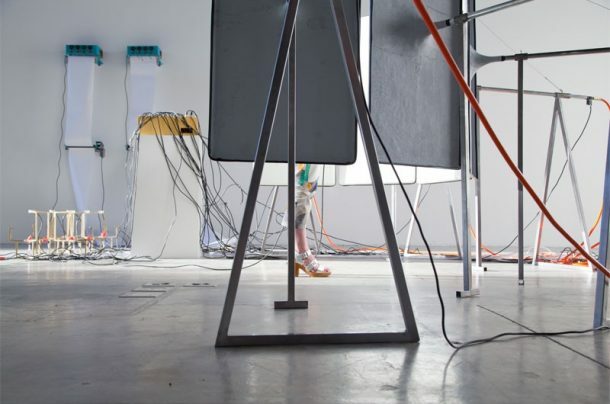 Through new media and creative technologies, she aims to trigger the viewers and convert them into active participants calling on them to transform her pieces according to their own personality. She is currently exploring themes of identity, memory, narrative and media archaeology. She is cofounder of ‘Frown’, an art organisation that focuses on the integration of public in the artistic action and its familiarization with the methods and practices of new forms of art. Space Station V is an immersive interactive space station experience, that brings together making, hacking, theatre and technology. Built by the team who turned a caravan into a spaceship simulator, as seen at some of UK’s Maker Faires, Space Station V resembles a large theatrical set that features a series of mini games and intriguing items to whisk people away into a fantasy realm where they are stuck on a failing space station. Working together to solve puzzles and games (hidden behind an overarching storyline) the cadets will be led by a crew though the narrative to their own unique story’s conclusion. Participants may need to find hidden panels to connect override cables, or shout commands at each other across the station to avert the power core from overheating. Maybe a vital tool has been lost out of the airlock and its someone’s job to operate a remote arm via video link to get it back. Space Station V is an immersive experience that blends physical with digital and transport audiences to a different world. Bikeshed productions are a group of members from the London Hackspace. They have worked together on projects such as extreme crazy golf courses and more notably the LHSBikeshed, a 3 player sci-fi shuttle craft simulator built in a caravan. Created from scratch the LHSBikeshed was built over 2 months and constantly improved over the last 18 creating a theatrical experience, where the participating audience have control over the narrative and outcome of the story. Synthetic Factory proposes its audience to physically construct kinetic life-like structures or ‘creatures’, using a set of specially made blocks, designed as a creative interpretation of the bio-bricks that enable the creation of ‘synthetic life forms’. Through didactic and creative play, this project enables to manipulate few basic ‘building blocks’ in an attempt to generate new life forms capable of interactions and evolving according to their environment. It is a creative platform designed to enable its audience, children and adults, to engage with the emerging paradigm of biological engineering. Synthetic Factory intends to spark conversations and interest in science practices within the field of biological engineering. It proposes a creative interpretation of what genetic engineering could be like at a higher level of manipulation. Sitraka Rakotoniania was born in Madagascar and grew up in Paris. He holds a BTS in Industrial Design and an MA in Graphic Design & Multimedia. He moved to London in 2008 to complete a Master in Design Interactions, at the Royal College of Art. He has worked as an Art Director for StudioZero in Shanghai, before moving to Wieden and Kennedy as a researcher and creative technologist in their R & D Platform and a stint at Philips Design Probe in Eindhoven as an interaction designer. Most of this work was dedicated to imagining new experiences enabled by technology. Since then, he has specialised in designing objects, artefacts and devices as a form of storytelling to question and excite. He uses science as fuel to imagine new relationships between people and technology, whether it allows us to achieve something fantastic or perceive reality through a different prism.